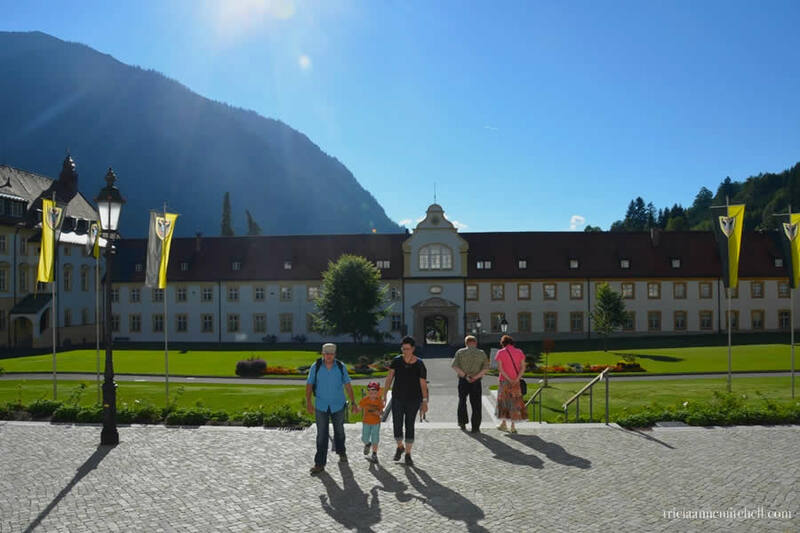 Our visit to Ettal was brief, as it coincided with errands in the nearby ski resort town of Garmisch-Partenkirchen, but it did offer just enough time to peek at the architecture, and stroll the grounds of the monastery. On a future trip, I’d love to visit the nearby dairy-making cooperative to sample the regional cheese and see how it’s made. 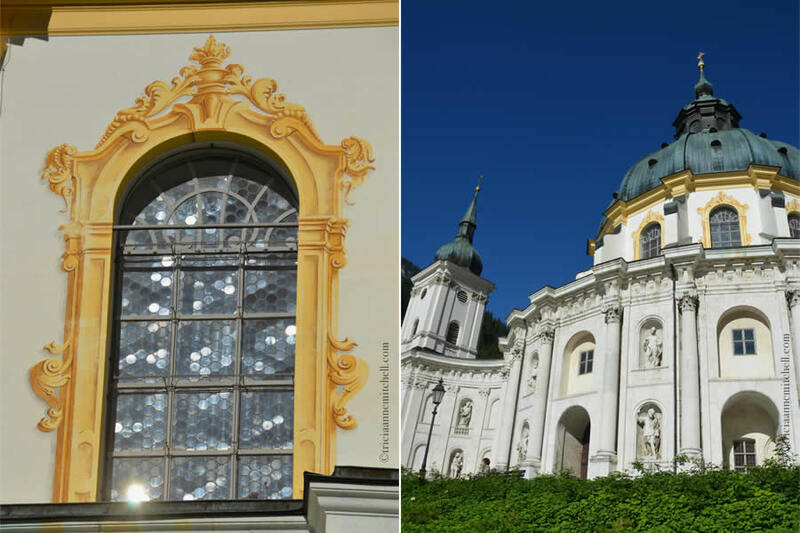 The basilica’s dome, is about 60 meters high (200 feet), making the structure tower over the village of Ettal. Elaborately-painted frescoes on the dome of the church. On the right, four mischievous cherubs. 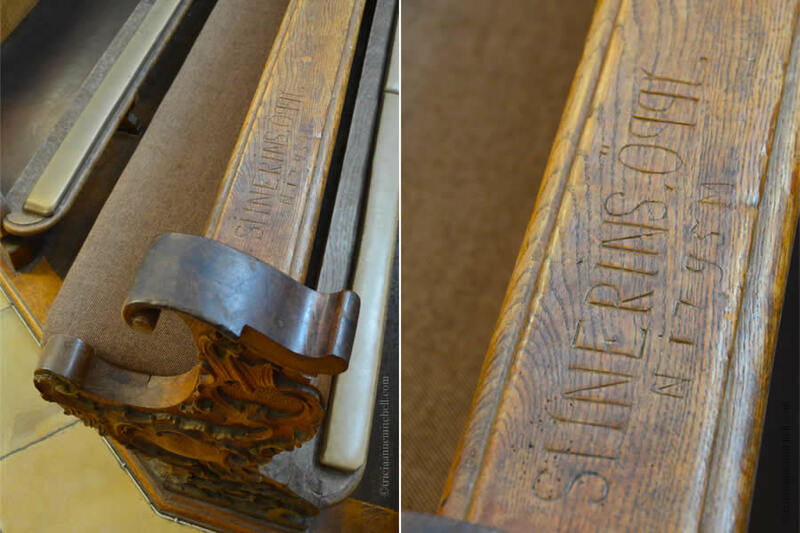 Eighteenth-century grafitti carved into the wooden church pews. 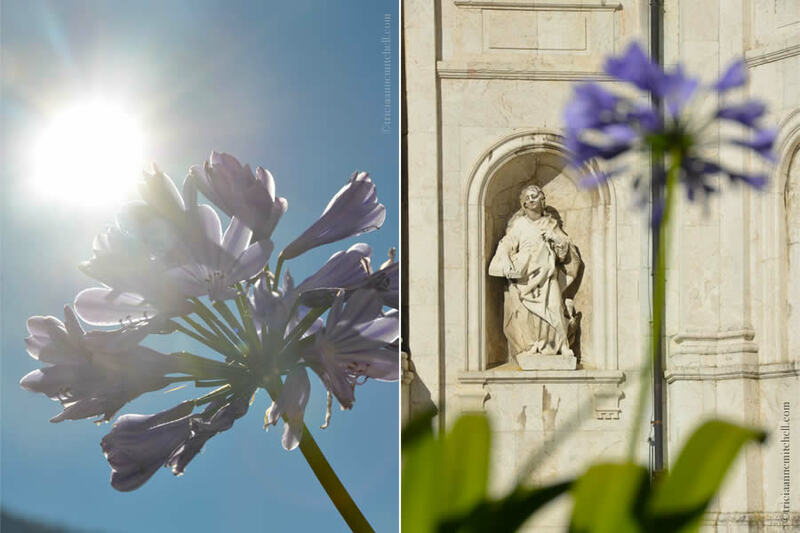 A cherub statue points to the sun-drenched dome. The windows of the dome sparkle in the midday sunlight. On the right, a World War II memorial. Before continuing on with our errands in the city of Garmisch-Partenkirchen, we stopped at a restaurant’s Biergarten to enjoy a cup of coffee. In the land of freshly-brewed beer, and distilled liqueur, it’s probably a sin that we opted for Latte Macchiatos instead. :) In his left hand, Shawn holds the beer coaster bearing the image of the famous monastery across the street from the café. 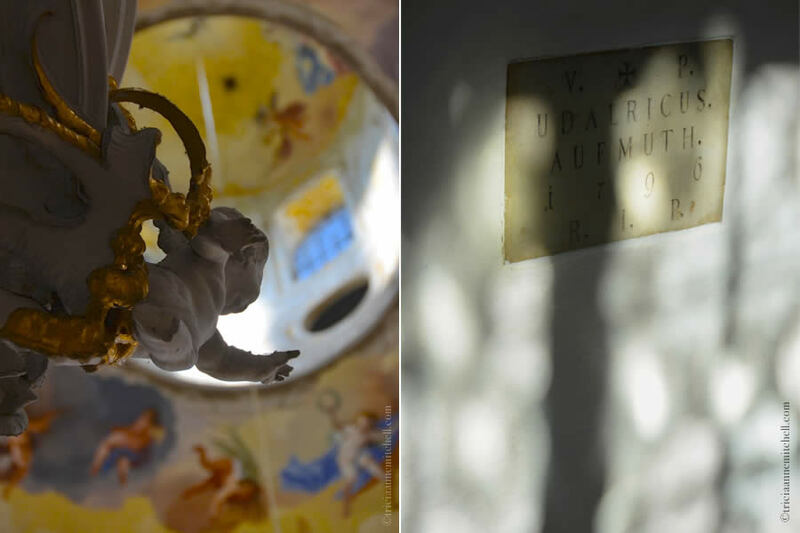 There is no cost to enter the Ettal Monastery Church to take a peek, but be sure to check the opening hours before you go. If you need more trip-planning inspiration, this link contains an index of all my posts from Germany. Hi Rika, the elaborate Old World architecture certainly is impressive, isn’t it? My blog is a labor of love for me – glad you enjoyed it, and thanks for your kind words. Anytime my dear it’s just the truth !! I love the mix of photos from all angles, clues-ups to distant shots. My favorite was the ancient graffiti. Looks like a wonderful stop. Naomi, seeing that ‘ancient graffiti’ carved into the pews, I pondered – at what point does graffiti become part of the accepted history of an Old World place? This village is just minutes’ away from where my parents live in Germany, so I do hope to get back someday soon to try out the regional cheese in the nearby dairy cooperative. So interesting a question, Tricia, and one that I pondered when we visited Chimney Rock and saw all the graffiti left there by the Oregon Trail pioneers who had passed by in their prairie schooners and carved their names into the rock. I am always amazed at all the amazing places in Europe. This is another example – thanks for showing us. By the way, what did you think of Garmisch? 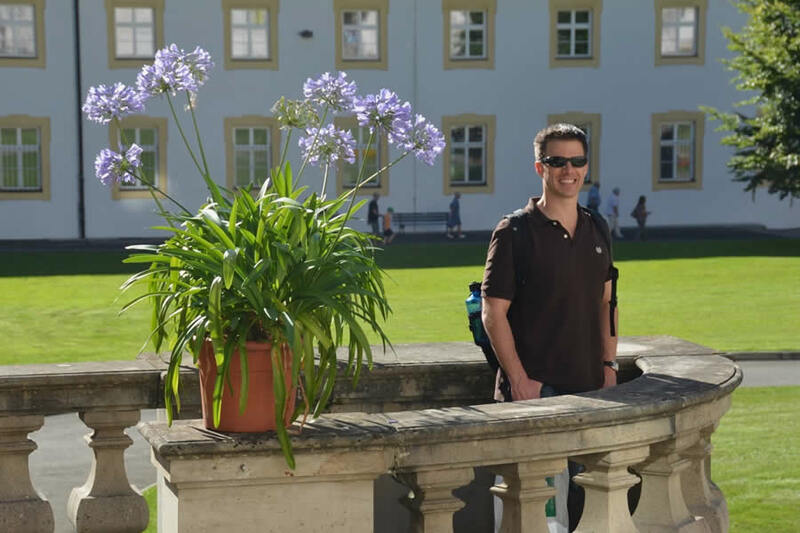 Jeff, that’s precisely why I enjoyed living in Germany for a decade – there was such a plethora of spots of a historic or beautiful nature to explore, most within driving distance, or a short flight away from my former home in Heidelberg. I must confess that I’m a bit spoiled to have my parents living right near Garmisch now, and as a result, I don’t think I’ve given it the attention it deserves. I skied there as a child, and remember some visits when the streets were dressed in snow. 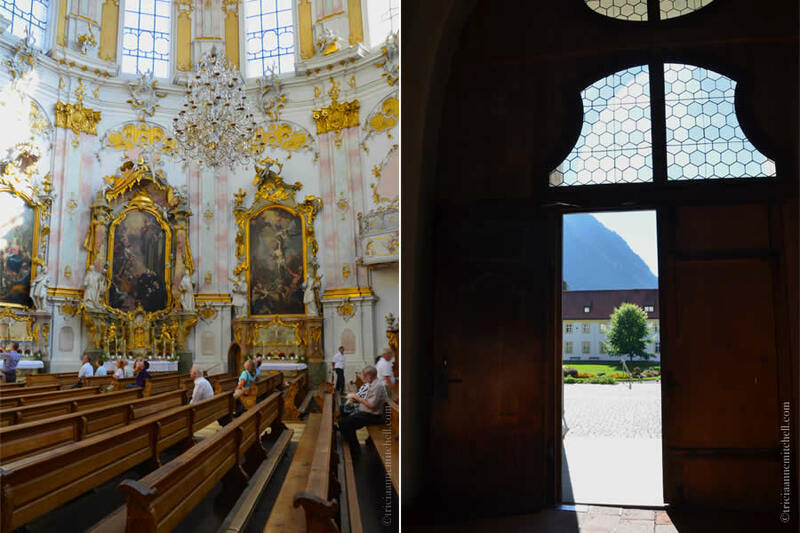 Now, I love going there to admire the Lüftlmalerei-adorned buildings (similar to these in Oberammergau: https://triciaannemitchell.com/2013/10/20/oberammergau-germany-windows/). I’d also like to get back to Garmisch and spend an afternoon exploring Partnachklamm. Have you been to Garmisch? Part of the reason I ask, is there is a lodge there owned by the U.S. government that employees Americans. I have few friends working there and I’ve thought about applying. It looks like a spectacular area. When in Bavaria about 13 years ago, I met an elderly couple from Munich and they invited us to stay with them. It was probably the best 4 days of my travels. I could write 5000 words on that experience. Hi Jeff, you might be thinking of the Edelweiss lodge in Garmisch? 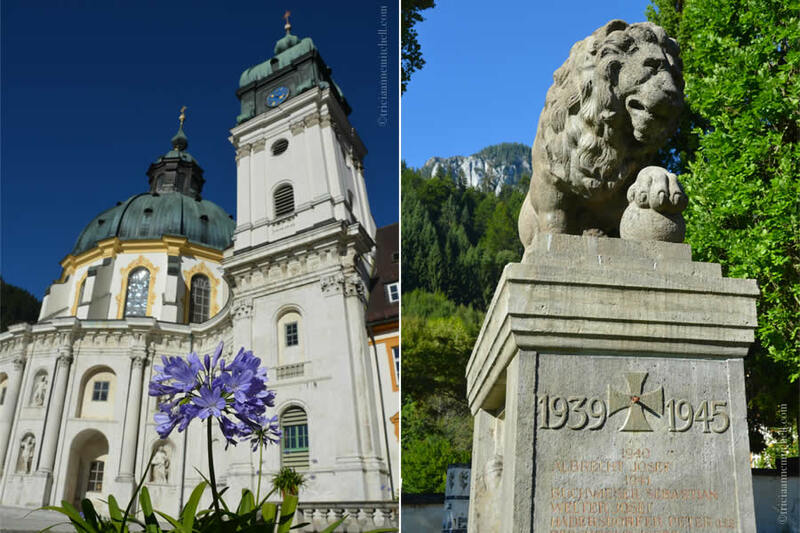 I haven’t personally stayed there, but would agree that Garmisch’s landscape is stunning! I’ve particularly enjoyed the hiking opportunities that are available near my parents’ village in the Ammergau Valley. Your encounter with the hospitable Bavarians sounds like a long-form piece in the works? :) Such are the stories that make travel a gift. Excellent post, great images and the map was an especially nice touch. Thanks for the very useful information. Robin, glad to hear that you enjoyed the introduction to Ettal. I think it’s quite remarkable that such a sophisticated structure is nestled among quaint Bavarian towns. I’m lucky to have my parents nearby so that we always have an excuse to visit Bavaria! 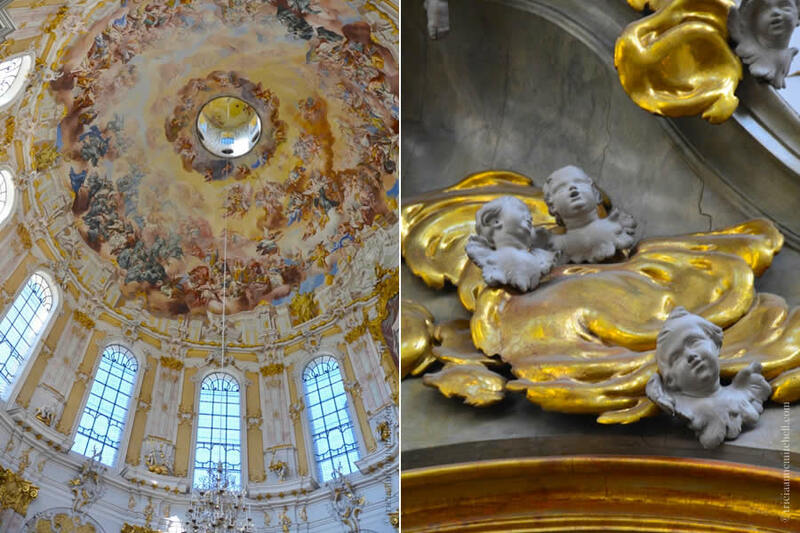 Oh, Kloster Ettal is such a beautiful place, the entire surrounding and the dome have some kind of spiritual appearance. Just driving up there is such a treat , on a sunny day of course. I have been at that dairy place, “Kaeserei” , years ago with my mom when she was still capable to leave the house and as you know my by 103 year old aunt lives in Garmisch/Burgrain, back than we went to visit her. You’re right that the monastery and grounds have a dramatic appearance about them, Cornelia. Shawn and I first saw Ettal through a very rainy windshield in 2011, before my parents had moved to O-gau. The downpour was so strong that we didn’t get a chance to visit the monastery or Schloss Linderhof during that trip; we’re lucky to have my parents living nearby now. What did you think of the Kaeserei? Did you get to see the cheese being produced, or do they just have a shop in which you can purchase it? Hi Tricia, I didn’t see how the cheese is produced, just the wonderful big wheels of cheese. But you know that was at least7 or 8 years ago, it might have changed by now. Another niece in Germany is getting married in September, yet this my busiest season of work, I might come over for just a short visit of one week or ten days. Don’t want to miss out on her happiest day. Fingers crossed that you’ll make it over the Atlantic for your niece’s big day. Will the wedding be in Bavaria? Tricia, that was beautiful. I love your pictures and your descriptions. For a few minutes I felt like I was there. 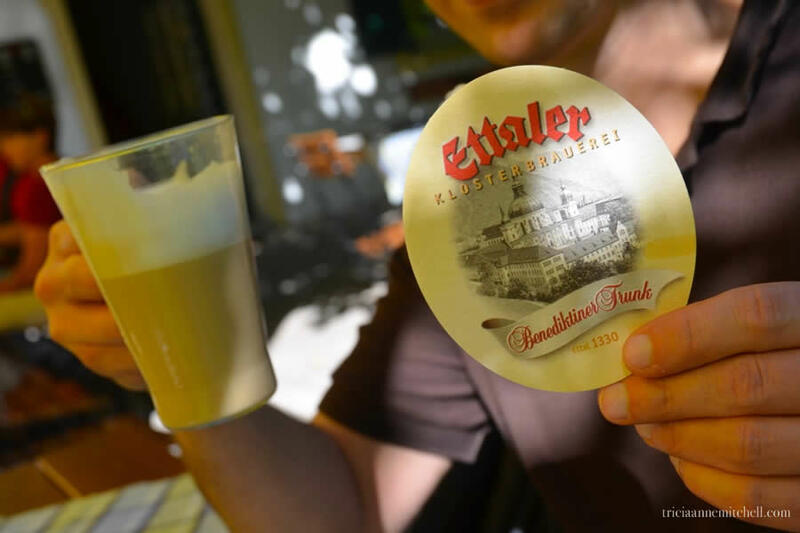 Since you appreciate making your own wine, I bet you’d enjoy delving more into Ettal’s / the resident monks’ beer-brewing and liqueur-making history! Tricia, I would love to taste their beer. Did you have any? Alas, Gerard, I didn’t have any beer since it has gluten via the barley. I have, however, tried the monks’ liqueur. It was a tad sweet, but we enjoyed using a bit on a fruit dessert at home. I had radler a long time ago. I liked it. How beautiful! My husband would love trying the beers and liqueurs. Carol, perhaps you’ll have to add Bavaria to your must-see list then. :) Of course Munich (about 1.5 hours away) is also well known for its breweries. We’ve already spent a week each in Munich and Bavaria. Much of the time was spent in breweries. Ha ha! Did you try the beer? A monastery for knights and monks sounds intriguing. Were the knights supposed to protect the monks from enemy invasions? Until the monks brew a gluten-free version, I won’t have the pleasure of trying it :) but it’s definitely a favorite among the locals in this part of Bavaria. Regarding the knights, I haven’t been able to find that out, Bespoke Traveler, so it looks like I have some questions to ask of the locals when I’m next back in Oberammergau! Lynne, indeed, it was a fun day of combining must-dos with an excursion. Ettal is not far from my parents’ home, so I’d love to bike out someday. There is a nature preserve in this valley (one of the largest in Germany), so that makes for scenic surroundings and relaxing rides. It is amazing to run across buildings or architecture in rural areas, one of the great reasons I love travel outside of the big/popular destinations as these are the places that hold an interesting piece of history that tends to fascinate me the most. Great photos ~ and the 2nd shot is perfect…worth a beer or two! Thank you very much. NYT is blocked in China due to an article about one of the leaders’s family immense wealth, but can check it out here in HK. It’s easy to take access to information for granted. Glad you can get to the news in HK though!